The Virtual Boy (Japanese: バーチャルボーイ Virtual Boy) was a video game console designed by Gunpei Yokoi and released by Nintendo on August 14, 1995, intended to be the successor to the Game Boy line. Designed to bring virtual reality into the home with "true 3D visuals", it consisted of a visor on a pair of spindly legs, and used cartridges that were similar to those of a Game Boy's in size and appearance. Ultimately, the Virtual Boy was poorly received and was a commercial failure, released only in Japan and North America with a full library of only 22 games before its discontinuation in March 1996, less than one year after its release. 1.26 million units were shipped worldwide before the system's discontinuation, and of those it is reported that only 777,000 were ever sold. Because of its rarity, the Virtual Boy is regarded as a valuable collector's item despite its reception and reputation. 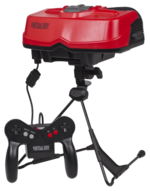 The Virtual Boy was first unveiled as the "VR32", a next-gen console that would serve alongside the upcoming Nintendo 64. Whereas the Nintendo 64 would bring Nintendo games into 3D on a 2D screen, the Virtual Boy was said to put the player into the game, to experience it almost firsthand. The design of the console has been described as mushroom-like, with the red visor sitting atop two small legs crossed at the middle. Instead of a small screen or inputs to a television, the Virtual Boy features a viewfinder that looks into the system, where the images are displayed. Each eye sees a slightly different image, leading to the perception of a three-dimensional shape. Due to cost and the low-quality nature of LCD displays in 1995, it was decided ultimately that the system would not be in color, but in monochrome, like the Game Boy. Unlike the Game Boy, however, which featured shades of gray pixels on a greenish screen, the Virtual Boy uses red LEDs to create images on a background of black. This proved to be painful to the eyes, and Nintendo's many warnings of eye strain to customers dissuaded them from purchasing the console. The upcoming Nintendo 64 also dissuaded many who did not wish to pay for two new consoles in such a short span of time. Gunpei Yokoi left Nintendo to found his own company after the Virtual Boy was discontinued. Although most claim he was unceremoniously demoted before his leaving, Yokoi had actually planned to retire after the launch of the system, and its failure had kept him from doing so. Yokoi had also designed the Game Boy Pocket, a more successful device, after the failure of the system and before he left. Nintendo's rivals at the time leading up to the release of the Nintendo DS believed that the system's dual screens would present players with the same trouble that the Virtual Boy did, leading to its own demise, and Nintendo averted any risk by choosing to market it as a third pillar, rather than as a continuation of and successor to the Game Boy line. The Virtual Boy uses a variant of the Game Pak cartridge format for its games. Virtual Boy Game Paks can hold up to 128 MBits of ROM data. The Virtual Boy launched with four games: Mario's Tennis (the console's pack-in game), Teleroboxer, Red Alarm, and Galactic Pinball. Only 22 games were officially released for the Virtual Boy, the least of any Nintendo console ever produced. Of those games, 14 were officially released in North America, and 19 were released in Japan. However, only ten of these games were published by Nintendo. Over twenty additional titles were also in development or stated to be in development before the system was officially discontinued and all games in production were cancelled. The Virtual Boy Controller is the main input for the system. The controller features an "M" shaped form factor, with four buttons, two d-pads on both sides of the controller, and a pair of shoulder buttons on the back. Also on the back of the controller is the slot for the Battery Box which powers the console. The AC Adapter Tap is an alternative to the Virtual Boy Battery Box that comes with the console. Like the Battery Box the AC Adapter Tap plugs into the back of the controller and allows the console to use an AC Adapter for power rather than batteries. The Adapter Tap is compatible with both the NES and SNES AC Adapters. The Virtual Boy Stereo Headphones are a pair of earbud headphones manufactured by Nintendo with the same color scheme as the Virtual Boy. The headhpones were released only in Japan. A Virtual Boy Game Link Cable was planned to be released at one point. Although versions of the cable exist, the Link Cable for the system was never officially released before the system was discontinued, and multiplayer games either had the feature scrapped or were cancelled alongside the system. A shoulder harness for the system was in development, an alternative to the system's tabletop stand base. Animal Crossing: New Leaf 2012 The Virtual Boy can be obtained as a furniture item in this game, as a new item in the Nintendo Set. Tomodachi Life 2013 The Virtual Boy can be obtained as an item by clearing a game. ↑ Hardware - Virtual Boy - Specifications. Planet Virtual Boy. Retrieved September 20, 2016. ↑ Hardware - Accessories - Shoulder Harness - Articles. Planet Virtual Boy. This page was last edited on 28 October 2018, at 23:29.